User experience (UX) design has changed quite a bit since the term was first coined in the early 1990s by Don Norman, then a cognitive scientist for Apple and now the director of The Design Lab at the University of California, San Diego. 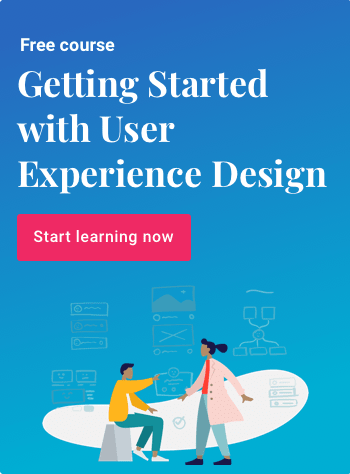 At its birth, UX design was a term used to denote all the significant factors related to a user’s experience, including the touch, look, and feel of things. For instance, Apple MacBook’s UX design translated into the experience of using the product in its entirety, including the purchase process, the packaging, the feel of holding a MacBook, and so on. However, for many, the meaning of UX design has narrowed down to chiefly cover designs of digital products like websites and apps. In a way, you can hold the changing trends responsible for this modern definition of UX design. If you look at it closely, you will note that the tapered meaning makes sense as the use of websites and smartphone apps has swelled. Adults in the U.S. are spending an average of 88.5 hours per month on their smartphones. Not surprisingly, 90 percent of this time on phones goes to using apps. Hence, with the rise in the internet’s popularity, user experience has gradually aligned itself with the design experience elements of these areas. This makes one thing clear: new UX design trends emerge as a result of the extrinsic changes that are in the air. Since design never evolves in isolation, let’s check out which external changes are going to cross the fence into 2019 and determine the patterns that we will observe in UX design. Artificial intelligence (AI) and automated technology have taken over the developmental horizon in several industries. Take chatbots, for example. Many businesses have welcomed their role with open arms. Seventy-one percent of customers rank valuing their time as the most critical aspect of customer service. There’s no better way to grant this wish then by assigning bots to solve customer queries instantly. However, simple versions of chatbots can help customers to a limited extent as their understanding is pre-programmed, leading to finite responses. So, while chatbots may help increase the pace of responses to customers, they may not fully solve the problem. Such automation jeopardizes personalization, the very element that is at the heart of customer service. This makes it pretty clear that the fields which demand customization cannot welcome automation completely. Doesn’t that sound familiar? With personalization at the center of UX design, the coming years won’t be able to oust human UX designers completely. It isn’t fair to turn a blind eye to the multiple efforts that have been recently made to pair design with AI to deliver design work. A case in point is Logojoy, a logo generator that allows people to make AI-based logos. Despite such steps, it is unlikely that design will become automated. Assuringly, AI can’t replace UX designers. However, it sure can help them. For example, it can assist in computing tons of color schemes, layouts, and more, which can boost the efficiency of the UX design process. Strategist Russel Davies sums up the blend of AI and UX designers precisely. In other words, designing is done for people as per their preferences, which is why automated technologies have a limited role to play in taking over the lead in the UX design field. 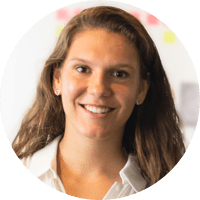 In this context, some examples of work that require emotional intelligence and an ability to understand user behavior include effective user testing and user research. AI can’t comprehend such complexities, leaving plenty of room for human touch in UX design. This explains the continued demand for UX designers and their well-paying salaries. Smartphone usage has swollen in recent years. Statista outlines that there were 2.1 billion smartphone users as of 2016. This figure is anticipated to increase to 2.5 billion by 2019. The number of apps used and the time spent on apps has ballooned as well. A report by App Annie confirms that people are spending more time on apps now than ever before. Individuals use roughly 30 apps monthly, with nine apps used daily. 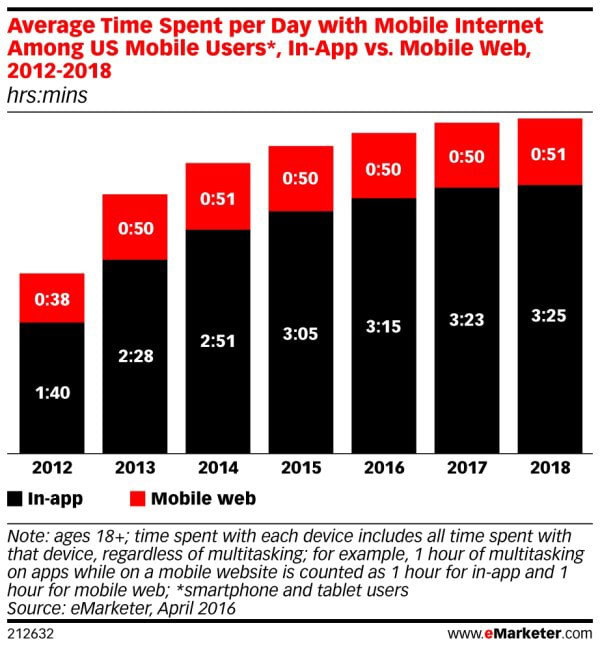 The graph by eMarketer presented below depicts the time spent on phones and apps. Since the number of mobile users is climbing, responsive web design is crucial to meet the needs of users. On top of that, the number of online stores has also shot up. The Forrester’s 2018 Retail Best Practices: Mobile Web study estimated that over $1 trillion of U.S. retail sales would come from smartphone users in 2018. Plenty of surveys and research show that there is a connection between the two platforms of online shopping: mobile websites and apps. Irrespective of who takes the lead in the long haul, it’s clear that both platforms need UX designers. This bears testament to one fundamental aspect: the expansion in the mobile app and website market is nowhere near a decline. If anything, the number of apps and mobile websites is increasing, which widens the market for UX design. Anyone who wants to tap into the increasing number of smartphone users has to ensure that the user has an excellent experience. After all, only a second’s delay in loading the website can cost a business customers. All this widens the flourishing market for UX designers to improve the experience of applications and mobile website users in the coming year. The average person encounters as many as 10,000 marketing messages in a day. He ends up hardly recognizing the business that he is interacting with on a day-to-day basis. Fighting for a user’s attention is, therefore, becoming a norm. This norm will continue into the coming year. It pretty much syncs with UX design too, as a leading way to attract user attention is by improving the user experience. One way to differentiate your design is to plan it in a manner that it tells compelling stories. The crux of the matter is that the human brain is wired to remember powerful narratives. Researchers agree that storytelling lights up more of your brain, which helps you remember things better. Therefore, a leading trend of 2019 will revolve around further strengthening UX design with storytelling (and don’t forget usability testing). Storytelling employs elements of close human connections, empathy, and in-depth comprehension of user inspiration and motivation. To embed these elements in UX design, designers need to research and gather data on what the customer wants. For instance, UX designers can improve user experiences by introducing storytelling through VR or AR technology. Therefore, in the coming year, design for video will step beyond gesture preference and screen optimization. Another aspect that will correspond with the course that UX design will take in the coming months is increased personalization. Once the design wins user attention, the next step is to personalize the digital experience. A personalized user experience helps one stand out in the oversaturated market. To this end, factors such as human touch, the inclusion of voice-command design, or the use of material design are some ways to tailor the digital experience to the liking of users. Wearable technology is not limited to smartwatches only. They stretch into the health industry, where portable devices help monitor sleeping habits, heart rates, and so on. Wearables are designed to solve tons of everyday problems. For instance, helping to make payments or managing simple tasks like to-do lists. The good news is that the use of such devices is not anticipated to slow down anytime soon. Forecasts show the number of connected wearable devices worldwide increasing from 325 million to 830 million between 2016 and 2020. For these types of gadgets, UX is crucial to optimize the way a person uses and navigates the product. UX design for wearable devices takes minimalism to a whole new level while simplifying user experience and enhancing visual aesthetics. If you think that this is going to be easy, think again. An interesting fact is that tech giants such as Amazon, Google Maps, and eBay have all taken down their apps from the Apple Watch App Store. The reason: they were too challenging to use on a wrist-sized screen. Hence, in the coming year, it is up to UX designers to make sure that the interface of wearable gadgets flows logically and smoothly. In the words of Steve Jobs, “Design is not just what it looks like and feels like. Design is how it works.” Therefore, the need for UX design will stretch to innovative wearables that assist in curtailing the irritations of daily life. Summing up, 2019 will be a bright year for UX design. Although littered with technological achievements, there is little threat that those would be able to pose for UX design. If anything, AI and other advancements will offer assistance in the design field. Moreover, other innovative solutions will demand UX design. A similar demand for design will arise from the smartphone market to produce apps and mobile responsive websites. Lastly, UX design will continue its crossover with storytelling as the new year unfolds. 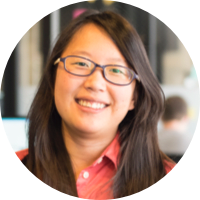 If you want to begin 2019 on the path toward a career in UX design, Springboard’s UX Career Track can get you there. It is a self-paced, mentor-guided bootcamp with a focus on helping you land your dream job in user experience. Find out more! 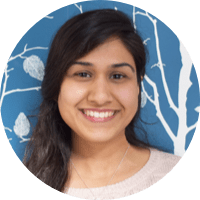 Masooma is a freelance writer by day and a novel nerd by night. Follow her on Twitter @inkandcopy.